Renovating your home, whether you plan to add new features or alter an existing space, can seem overwhelming. Should I hire a general contractor, or call individual tradespeople? Will the renovation be affordable? How long will construction take? At Foxx Renovations, we take the time to discuss your ideas and develop and accurate plans to help you realize your renovation goals. We offer a full range of construction and renovation services to both commercial and residential clients. Our qualified renovation experts work within detailed estimates, and take care of every hassle during each step of your construction project. We value the relationships we establish with home owners, and we take pride in our work! At Foxx Renovations, your satisfaction is the most important standard we strive for. We work hard at each step of the way to not only deliver professional-quality results, but to make sure our clients are comfortable with and understand the renovation and construction process. We've been exceeding expectations for over 20 years, and we're confident in your recommendation. It's crucial that electrical work be completed by a certified professional. At Foxx Renovations, we work with the best Master Electricians in Southern Alberta, careful to meet and exceed all national standards and building codes! From residential renovations to commercial construction projects, safe and efficient electrical installation lies at the foundation of everything we do. Decks, in-law suites, attics, and home expansions are great ways to add value to your home. Foxx Renovations can help you plan and construct your space the right way, the first time. Our experienced renovations experts stay up-to-date with the latest regulations and standards, handle all permits, and have the skills necessary to complete construction on time and within budget. From kitchens to bathrooms to wet bars, solid plumbing defines quality renovation projects. Improperly installed, issues can fester unseen until they create serious damage at the heart of your home. At Foxx Renovations, we work with the best Master Plumbers not just because we're committed to quality, but because we're committed to your long-term satisfaction. Your kitchen is the center of daily activity. It's one of the most important rooms in your house, and besides looking great, needs to be functional. We have the experience and vision to help you plan your perfect kitchen, and the skills and know-how to build it for you. We match the latest trends and materials with your budget considerations, for a perfect kitchen you'll be proud to call your own! A finished basement has a huge impact on home value. Whether you're looking for additional entertainment space, more accomodation room, or just a cozy family getaway, our professionals can make it happen. There is no substitute for experience, and with hundreds of completed basement renovations we're proud to stand out out as one of Calgary's premier basement developers. In addition, we handle all the permits, plumbing, and electrical – rely on Foxx for a complete, worry-free basement renovation! Your bathroom is a spa, a space to relax in. From aesthetics to plumbing, Foxx Renovations can provide you with a truly comfortable bathroom, all within your budget. Whether you'll looking to install multiple side water jets and a new jacuzzi, or simply want to update an older space with new tile and flooring, our knowledgeable and friendly staff will work with you to develop a bathroom renovation plan that suits any need. Foxx Renovations has over 20 years experience providing quality home improvements, renovations, and construction services. 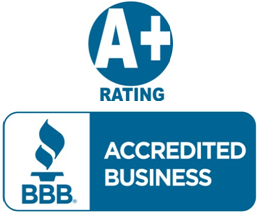 A member of the Better Business Bureau since 2000, our innovative and professional approach to both residential and commercial projects has earned us an A+ rating. Count on our qualified professionals to see the job through on time and within budget!